Ohio sophomore guard Amani Burke (#3) drives to the basket during the first half of the Bobcats’ 93-37 win over Notre Dame College on Nov. 16. 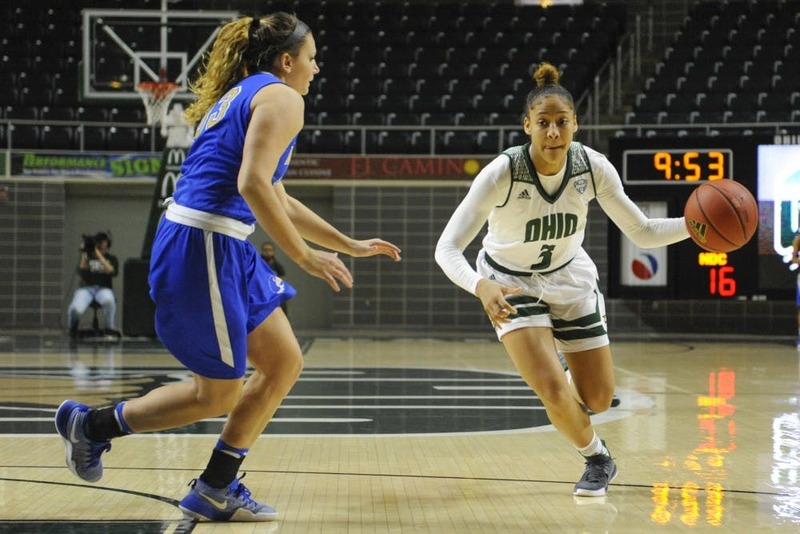 In its past four games, Ohio has played four formidable opponents: a top 25 team in Michigan, an underrated Eastern Kentucky squad and two quality Horizon League opponents in IUPUI and Cleveland State. Ohio only beat Eastern Kentucky out of the group. Coach Bob Boldon suggested the Bobcats perhaps didn’t take the Colonels seriously enough until the second half, when they outscored them 37-24. It’s the Bobcats’ second Big Ten game of the season, and it’s another opportunity for growth. The Bobcats will play the Boilermakers on the road Sunday at 2 p.m. in Mackey Arena. Purdue went to the second round of the NCAA Tournament last season, losing to No. 1 seeded Notre Dame 88-82 in overtime. The Bobcats have encountered challenges to start this season, most notably their low shooting numbers and mediocre offense. Ohio is shooting 34.8 percent from the field and 23.0 percent from three. Still, the challenges the Bobcats have faced, and the challenges that are ahead, are only going to help them as Mid-American Conference play nears. Playing a perfect game doesn’t exist. But when the Bobcats played the Wolverines in November, they showed why they aren’t a team to be ignored. The game was close until the fourth quarter; the Bobcats were only down by three at the end of each quarter until the fourth. The Wolverines’ top 25 status didn’t fetter the Bobcats – they were at home. Also, they boasted one of the MAC’s best defenses. Ohio has the top turnover margin in the country, and it forced Michigan to commit 23 turnovers. That tied a season-high in turnovers for Michigan, with Louisville being the only other team to make it commit as many turnovers. The Bobcats’ offense hasn’t played well to begin this season, but the defense has. And the Bobcats have won games because of that. Recently, the Bobcats have had to focus more on offensive improvement, and the defense has taken a slight dip because of that. Ohio is still a quality defensive team; that side of the ball is stronger than the offensive side. But as Ohio prepares for Purdue and beyond, improvement — on both sides of the ball — will be paramount for its success.